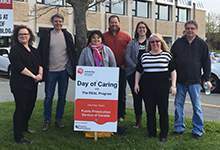 17 workplace volunteer teams, through United Way NL, spent all or part of the day on Thursday, June 14 completing hands on projects for 18 community groups. The REAL Program is immensely grateful to the volunteers from Public Prosecution Services of Canada who gave our sports equipment library a thorough and much needed cleaning after a season of use. The REAL Program provides recreation and leisure opportunities to children and youth in financial need. It matches children and youth, up to the age of 18, with an organized recreational activity of their choice. The REAL Program is fully dependent upon community support. If you are considering donating to the REAL Program, check our website or call us at 576-8684.